Drunk drivers have the destructive power to shatter and end the lives of innocent drivers, passengers and pedestrians. For those whose lives have been impacted by the reckless actions of a drunk driver, there are legal recourses available. At The Orlow Firm, we are dedicated to helping victims of drunk driving accidents recover compensation for their medical bills, lost wages and other hardships. We are also determined to hold drunk drivers to account — to help our clients and to deter others from acting in the same careless manner. Contact our Brooklyn law firm today to speak with an experienced Brooklyn drunk driving accident lawyer. Drunk driving accidents can result in brain injuries, spinal cord injuries and other catastrophic injuries. All too often, they result in wrongful death. In a drunk driving accident case, it is possible to recover not only compensatory damages (compensation for medical bills, wage loss and other losses) but punitive damages as well. Punitive damages are intended to punish the drunk driver and deter others from drunk driving. They can also substantially increase the awards to the injured and family members who have lost loved ones in drunk driving accidents. We understand the complex legal issues at play, including social host and liquor liability. We are experienced trial lawyers and will stand up for your rights, seeking justice and full compensation for the losses you have suffered. Have you or a loved one been injured by a drunk driver? If so, contact our Brooklyn car accident lawyers today for information regarding your legal rights. 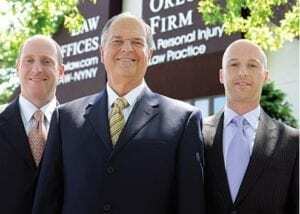 To speak with an attorney at the Orlow Firm, call (646) 647-3398 or message us online.